A wireless neurosensor, developed in the neuroengineering lab of Brown University professor Arto Nurmikko, sends the signals gathered by the brain chip wirelessly to a computer that decodes them and sends them wirelessly back to an electrical spinal stimulator implanted in the lumbar spine, below the area of injury. That electrical stimulation, delivered in patterns coordinated by the decoded brain, sends signals to the spinal nerves that control locomotion. The ability to transmit brain signals wirelessly was critical to this work with monkeys, the researchers note. Wired brain-sensing systems limit freedom of movement, which in turn limits the information researchers are able to gather about locomotion. Despite current limitations, the research sets the stage for future studies in primates and, at some point, potentially as a rehabilitation aid in humans, the researchers suggest. The study, published in the journal Nature, was performed by scientists and neuroengineers in a collaboration led by Ecole Polytechnique Federale Lausanne (EPFL) in Switzerland, together with Brown University, Medtronic and Fraunhofer ICT-IMM in Germany. The research was funded by European Community’s Seventh Framework Program, International Foundation for Research in Paraplegia Starting Grant from the European Research Council, The Wyss Centre in Geneva Marie Curie Fellowship, Marie Curie COFUND EPFL fellowships, Medtronic Morton Cure Paralysis Fund fellowship, NanoTera.ch Programme (SpineRepair), National Centre of Competence in Research in Robotics Sinergia program, Sino-Swiss Science and Technology Cooperation, and the Swiss National Science Foundation. Spinal cord injury disrupts the communication between the brain and the spinal circuits that orchestrate movement. To bypass the lesion, brain–computer interfaces have directly linked cortical activity to electrical stimulation of muscles, and have thus restored grasping abilities after hand paralysis. Theoretically, this strategy could also restore control over leg muscle activity for walking. However, replicating the complex sequence of individual muscle activation patterns underlying natural and adaptive locomotor movements poses formidable conceptual and technological challenges. Recently, it was shown in rats that epidural electrical stimulation of the lumbar spinal cord can reproduce the natural activation of synergistic muscle groups producing locomotion. 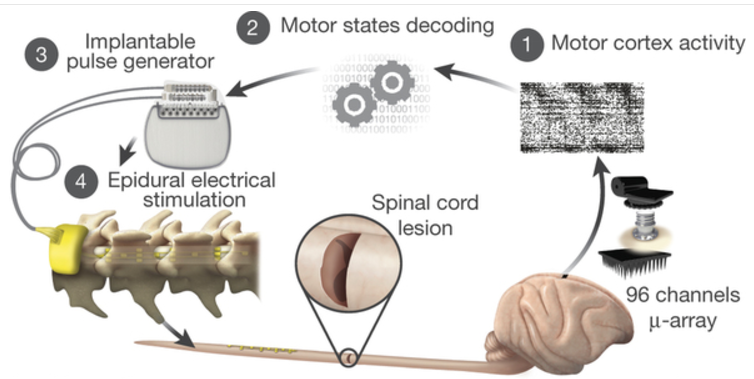 Here we interface leg motor cortex activity with epidural electrical stimulation protocols to establish a brain–spine interface that alleviated gait deficits after a spinal cord injury in non-human primates. 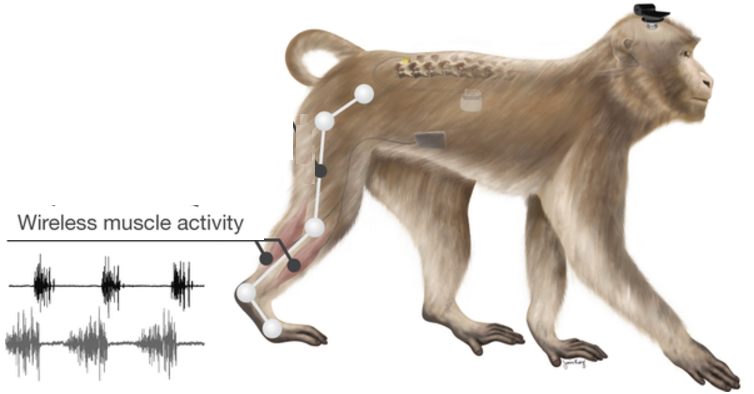 Rhesus monkeys (Macaca mulatta) were implanted with an intracortical microelectrode array in the leg area of the motor cortex and with a spinal cord stimulation system composed of a spatially selective epidural implant and a pulse generator with real-time triggering capabilities. We designed and implemented wireless control systems that linked online neural decoding of extension and flexion motor states with stimulation protocols promoting these movements. These systems allowed the monkeys to behave freely without any restrictions or constraining tethered electronics. After validation of the brain–spine interface in intact (uninjured) monkeys, we performed a unilateral corticospinal tract lesion at the thoracic level. As early as six days post-injury and without prior training of the monkeys, the brain–spine interface restored weight-bearing locomotion of the paralysed leg on a treadmill and overground. The implantable components integrated in the brain–spine interface have all been approved for investigational applications in similar human research, suggesting a practical translational pathway for proof-of-concept studies in people with spinal cord injury.